One of my New Year's resolutions for this year is to get more healthy. I have a pretty sedentary lifestyle, so my goal is to go to the gym at least twice a week. I want to have more energy, stamina, and to be able to run for my life if I have to! I usually like to get all of my errands done in the same day, and if I have to run to the store afterwards, I don't want to look like I just came from the gym, so I thought I'd post about what to wear when exercising. Layering is one of my favorite ways to change up an outfit or add style. Try wearing two tank tops or a printed sports bra under a dropped armhole tank. Leggings are perfect for the gym and look great with an oversize top. Just make sure that they are made out of a material that is stretchy enough to work out in. Make a t-shirt and sweatpants more stylish by adding accessories. Jewelry should be sweatproof and soundproof, ideally made out of lightweight materials like hemp or raffia. I like wrap bracelets because they won't slide off or jingle. And if you're going to wear necklaces, make sure the chain length is short enough that you don't get smacked in the face! I'm not big on sneakers, so finding a pair I like that is also practical for working out in is quite the challenge. This pair from Forever 21 is perfect! They're not too chunky and I love the southwestern pattern. These leather bracelets are specially made for athletes. They are meant to be worn while working out and can withstand perspiration. See all the styles at Endorphin Warrior. I am a big Eagles fan, and I love this shirt from Victoria's Secret PINK NFL Collection. Right now, these styles are 40% off online! Printed leggings are a great way to add some style to an otherwise plain workout look. 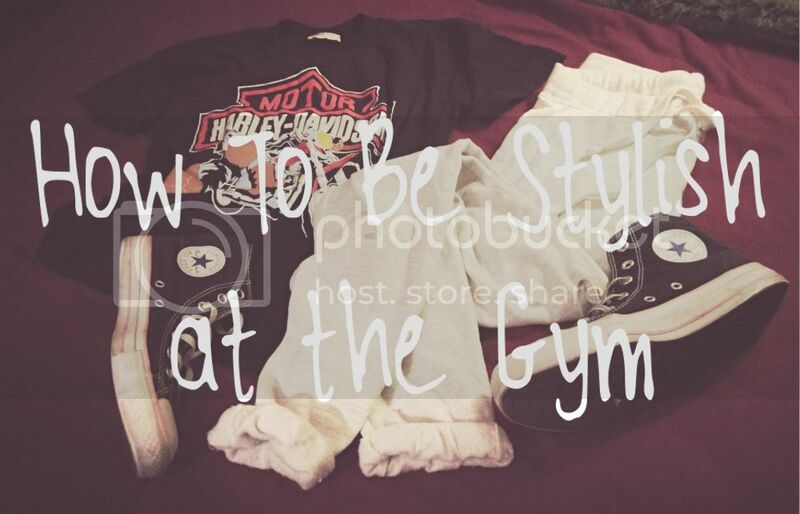 Follow this Pinterest board I made for lots more ideas of what to wear to the gym. Fun post! The gym is usually such a fee pass to be a mess! I like the idea of being fashionable there. Wow!! Such a great collection of gym wear. Loved this entire collection. Looking for some best workout clothes for my gym training but still haven’t found any. Will check on internet. Hope will get some best offers on them.